The use of electrical resistivity method for quality control and evaluation of concrete durability is becoming very popular among scholars and engineers. The measurement of electrical resistivity of concrete provides useful information about the microstructure of concrete material. The test procedure has since been standardized by AASHTO TP 95. This method is adapted by several Department of Transportation (DOTs) to replace the labour-intensive and time-consuming methods such as the ASTM C 1202, “Electrical Indication of Concrete’s Ability to Resist Chloride Ion Penetration”, generally known as the Rapid Chloride Peremeabiliy Test (RCPT). Electrical resistivity, ρ, is an inherent characteristic of concrete material, which is independent of the geometry of the test sample. Resistivity is calculated through measuring electrical resistance, R, in an appropriately designed circuit, and applying certain geometry factor, γ. Equation 1 provides a simple representation of such relationship. The resistance of concrete against electrical current can be correlated to its resistance against chloride ion movement. Concrete durability depends to the properties of its microstructure, such as the pore size distribution and the shape of the interconnections (Layssi et al, 2015). Generally, a dense microstructure provides better durability compared to porous micorstructure. The very concept behind most electrical resistivity techniques is to somehow evaluate the electrical properties (resistance in this case) of the microstructure of concrete. Four-probe method uses four electrode to measure the surface electrical resistivity of concrete. The arrangement of the electrodes is famously known as Wenner Array, and consists of four electrodes that are placed over the surface of concrete. The outer electrodes create an electrical current in the concrete, and the interior electrodes measure the induced potential. The resistance is then calculated by dividing the potential difference to the current. Th Wenner probe is the most famous of the two, mainly because of its simplicity, and being portable, which make it great for field test. Two-probe method is used to measure the bulk electrical resistivity of concrete. 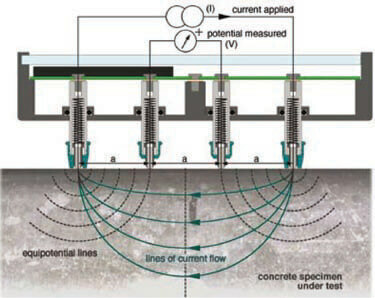 In this technique, the concrete sample is placed between the two electrodes, and the potential is measured after applying the current. Normally, a wet sponge is used to provide contact between the electrode plates and concrete surface. Since the current is passing through the bulk of concrete, this technique provides better indication of concrete electrical resistance. + Corrosion rate of embedded steel. Electrical resistivity measurement have proved to be a very suitable method for investigating the properties of fresh concrete such as setting time, moisture content, etc. Nadelman and Kurtis (2014) demonstrated the use of surface resistivity method for the influence of binder composition on the rate of microstructural development in concrete, which makes it an alternative for assessing future performance. This entry was posted in Inspection and Evaluation, NDT and tagged Durability. Bookmark the permalink.